The OASE Pond Jet ECO has been completely re-engineered and features the all-new ultra energy efficient Eco Motor Technology, meticulously developed by OASE Engineers in Germany. 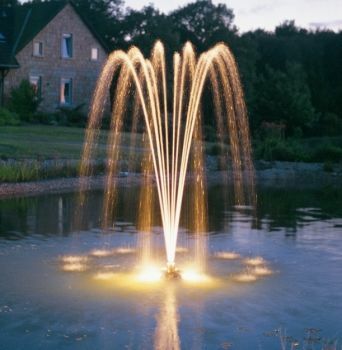 The floating pump is specifically designed to offer the minimum running costs (only 190 watts total power consumption) whilst producing a stunning decorative fountain display in any pond or lake. 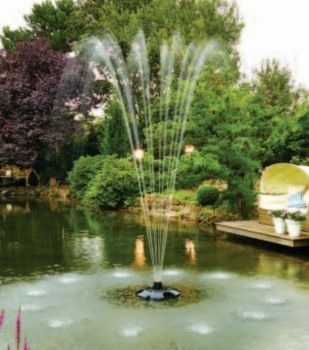 The new Pump is fitted with a special toggle switch allowing the fountain to rise and fall in an elegant pre-programmed dancing water display. The switch can also be set to produce the standard full fountain display of around 3 metres (10ft) height x 3 metres (10ft) diameter. View the Product Video tab below. 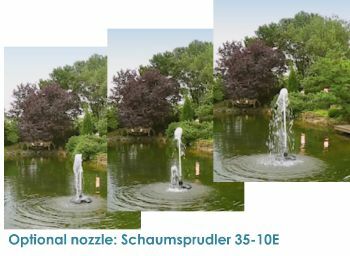 The submersible pump is suspended from the underside of the float assembly, allowing clearer water to be pumped up to the integrated 12 jet decorative fountain nozzle (supplied). 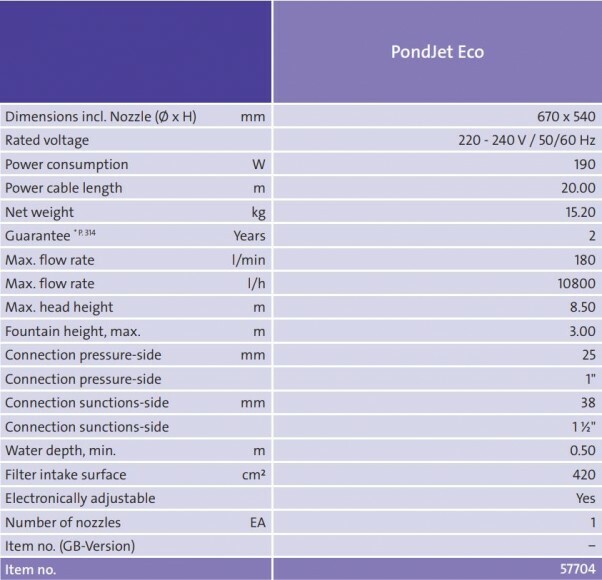 Due to the floating design, the PondJet ECO can be used in heavily sedimented ponds and lakes or for use where water level fluctuations occur. 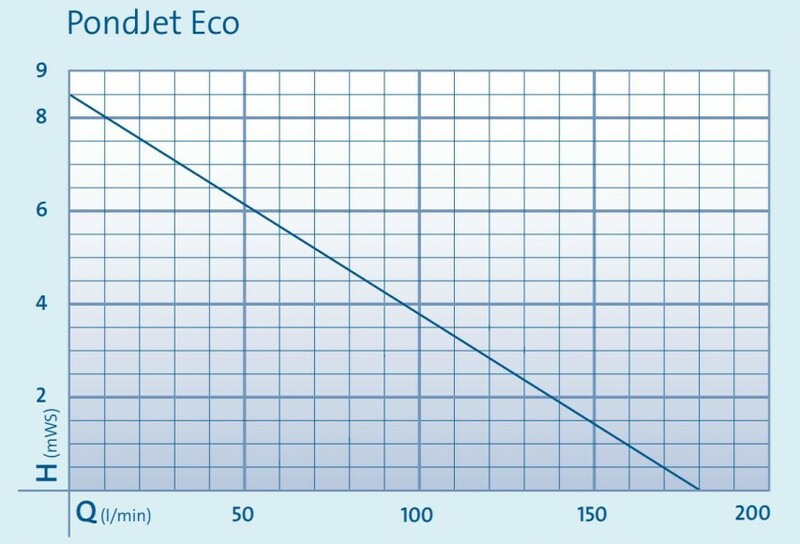 The Pond Jet ECO will require a minimum water depth of 1 metre (3ft) in clear water or 1.5 metres in silted water. The special Pump is supplied with 20 metres of 230 Volt electrical cable and the float comes complete with anchoring points for securing to the pond or lake floor (we suggest the use of heavy duty fishing wire tied to a suitable weight, to anchor the fountain float and maintain the position within the pond area). The PondJet Eco Floating Fountain can also be fitted with the optional Halogen Lighting Kit or the new Power LED Lighting Kit for producing a stunning illuminated water display in the evening time. New for 2017 is the ProfiLux RGB Colour Changing Light Set for the Pond Jet fountain. IN STOCK - Delivery typically 1-2 working days. 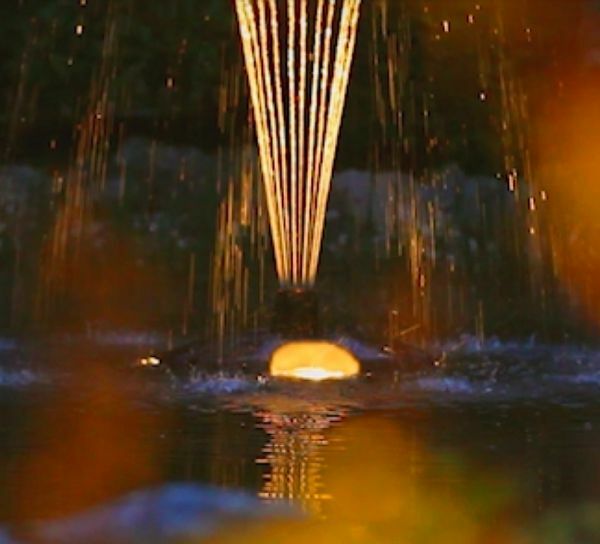 The Pump is fitted with a toggle switch that will allow the user to select either the full 3m high, 3m diameter fountain display or the alternating pre-set program which causes the water display to rise and fall, creating a dynamic pattern. The dancing display will also save on running power consumption compared to the predecessor model's (Pond Jet Classic) fixed water display, consuming 60% less power (an average of 105 watts saving). 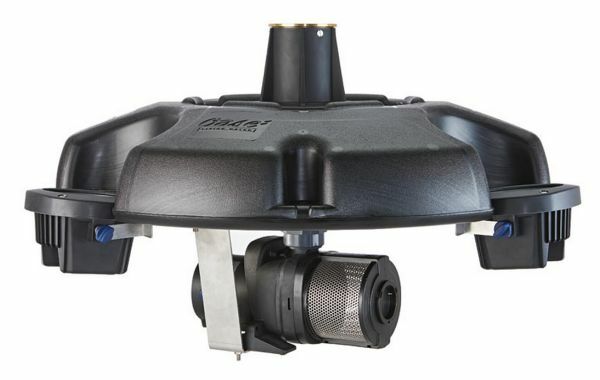 Note: The PondJet Eco can also be used with the optional FM Master 3 Remote Controller if desired, allowing control of the fountain display height at a range of up to 80 metres away. The Eco Pump toggle switch will need to be set in the off position to allow electronic adjustment via the FM Master 3. Bought the fountain as a water feature to go in the pond by the 4th green at Mickleover golf club in Derby and it looks great! Excellent product, really well made and looks terrific in the lake. 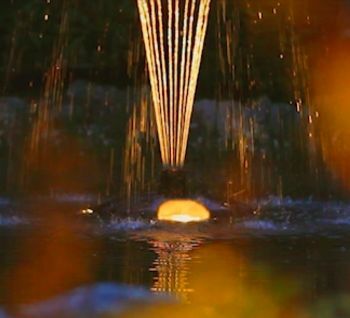 We absolutely love this fountain. We have it in our gardens at Swallows Rest B&B in Weymouth and our guests are amazed at the way it changes colour all night long.